The payment of a railroad retirement annuity can be affected by entitlement to social security benefits, as well as certain other government benefits. Such dual entitlement, if not reported to the Railroad Retirement Board, can result in benefit overpayments which have to be repaid, sometimes with interest and penalties. The following questions and answers describe how dual benefit payments are adjusted by the Railroad Retirement Board for annuitants eligible for social security benefits and/or other benefit payments. Since 1975, if a railroad retirement annuitant is also awarded a social security benefit, the Social Security Administration determines the amount due, but a combined monthly dual benefit payment should, in most cases, be issued by the Railroad Retirement Board after the railroad retirement annuity has been reduced for the social security benefit. No. However, if an employee qualified for dual benefits before 1975 and meets certain vesting requirements, he or she can receive an additional annuity amount which offsets, in part, the dual benefit reduction. This additional amount, reflecting the dual benefits payable prior to 1975, is called a vested dual benefit payment. Legislation enacted in 1974 coordinated dual railroad retirement and social security benefit payments to eliminate certain duplications; but this legislation also included a “grandfather” provision to preserve the pre-1975 dual benefits of persons meeting certain vesting requirements by including vested dual benefit payments in their annuities. Awards of these vested dual benefit amounts are now limited only to vested railroad employees with dual coverage on their own earnings. Spouses and widow(er)s retiring since 1981 no longer qualify. Of the over 16,000 employee annuities awarded in Fiscal Year 2002, less than 230 contained vested dual benefit payments. Vested dual benefit payments are funded by annual appropriations from general U.S. Treasury revenues, rather than the railroad retirement payroll taxes and other revenues that finance over 98% of the railroad retirement system’s benefit payments. Payment of these vested dual benefits is dependent on the time and amount of such appropriations. If the appropriation in a fiscal year is for less than the estimated total vested dual benefit payments, individual payments must be reduced by proration. Vested dual benefits are not increased by cost-of-living adjustments. 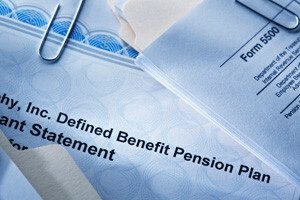 Tier I benefits for employees first eligible for a railroad retirement annuity and a Federal, State or local government pension after 1985 may be reduced for receipt of a public pension based, in part or in whole, on employment not covered by social security or railroad retirement after 1956. This also applies to certain other payments not covered by social security, such as payments from a non-profit organization or from a foreign government or a foreign employer. However, it does not include military service pensions, payments by the Department of Veterans Affairs, or certain benefits payable by a foreign government as a result of a totalization agreement between that government and the United States. The tier I portion of a spouse’s or widow(er)’s annuity may also be reduced for receipt of any Federal, State or local pension separately payable to the spouse or widow(er) based on her or his own earnings. The reduction generally does not apply if the employment on which the public pension is based was covered by social security on the last day of public employment. (A special rule applies to Federal employees who switch from the Civil Service Retirement System to the Federal Employees Retirement System.) For spouses and widow(er)s subject to the government pension reduction, the tier I reduction is equal to 2/3 of the amount of the government pension. The public service pension reduction in railroad retirement spouse and widow(er) benefits was brought about by 1977 social security legislation which also applied to the tier I portion of railroad retirement spouse and widow(er) annuities. Since a social security spouse or widow(er) benefit is reduced if the beneficiary is also entitled to a social security benefit based on her or his own earnings, it was considered equitable that a social security spouse or widow(er) benefit also be reduced for a public service pension based on the beneficiary’s own nonsocial security earnings. If both the husband and wife are qualified railroad employees and either has some railroad service before 1975, both can receive separate railroad retirement employee and spouse annuities, without a full dual benefit reduction under the phase-out provisions of the 1974 Railroad Retirement Act. However, if both the husband and wife started railroad employment after 1974, only the railroad retirement employee annuity or the spouse annuity, whichever he or she chooses, is payable. If a widow(er) is qualified for a railroad retirement employee annuity as well as a widow(er)’s annuity, a special guaranty applies in some cases. If both the widow(er) and the deceased employee started railroad employment after 1974, the survivor annuity payable to the widow(er) is reduced by the amount of the employee annuity. If either the deceased employee or the widow(er) had some railroad service before 1975 but had not completed 120 months of service before 1975, the widow(er)’s own employee annuity and the tier II portion of the survivor annuity would be payable to the widow(er). The tier I portion of the survivor annuity would be payable only to the extent that it exceeds the tier I portion of the widow(er)’s own employee annuity. If either the deceased employee or the widow(er) completed 120 months of railroad service before 1975, the widow or dependent widower may receive both an employee annuity and a survivor annuity, without a full dual benefit reduction.